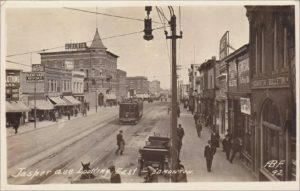 Jasper Avenue & 97 Street (Namayo Avenue), the heart of original Edmonton, has built heritage dating back to the 1880s. But Edmonton’s history goes far beyond surviving buildings. Archeological evidence of more than 800 Indigenous settlements and interim camps illustrates that Indigenous Peoples camped, traded, and thrived on the lands surrounding Amiskwacîw Wâskâyhkan (meaning ‘Beaver Hills House’ in Cree) for over 500 generations. The kisiskāciwani-sīpiy (‘Swift Flowing River’ in Cree) served as a superhighway for the Dene of the north, the Nehiyawak of the woodlands and plains, the Nakota of the foothills to the west, and the Tsuu T’ina and Niitsitapi of the south. The importance of this area as a river crossing and a gathering place for Indigenous Nations led the early fur traders to set up their forts here. By 1876, due to the decline in the buffalo herds, encroachment on their lands, starvation and disease, 50 Indigenous Nations signed a Treaty with the Dominion of Canada. Through the agreement process concessions and obligations were provided by Canada for, as the Indigenous Nations would interpret, a sharing of the land and resources “as long as the sun shines, grass grows, and rivers flow”. Today, the Treaties serve as a foundation for the sharing of land and resources within Canada. All people of Edmonton are Treaty No. 6 people. Boyle Street (named after John R. Boyle, a lawyer on Edmonton’s first Council) was part of the earliest non-Fort and non-First Nations settlement of this area and is considered Edmonton’s first downtown. In its earliest days it was inhabited by Métis, Scottish and Ontarian settlers. Soon Chinese, German, Jewish, Arab, and Ukrainian settlers arrived. By 1914, this street was full of people and horse-drawn wagons, and lined with shops, cafes, Chinese laundries, newspaper and theatre offices, livery stables, a candy factory, a piano shop, and more. The downtown core then moved west, leaving a declining neighbourhood. However, affordable housing, heritage buildings, and authentic spaces attract artists, new immigrants, and people of modest income. Today, about 6,000 people call it home, including First Nations, Metis, British, Vietnamese, Chinese, East Indian, Croatian, Spanish, Arabic, Somali, and Sudanese people.